September 20, 2018 – During a late summer sunset, members of ULI Baltimore gathered at the outdoor terrace of 414 Light Street. 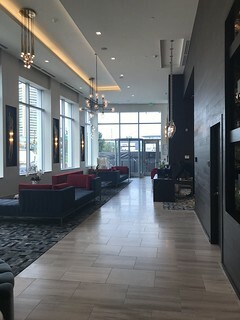 As the newest addition to the Baltimore skyline, 414 Light Street is the city’s first luxury mixed-use development consisting of apartments, garage spaces, and retail units. At the podium were Stephen Gorn and his son Zachary Gorn, developers of family-owned Questar Properties. They began the evening by acknowledging those who brought the project to life: the lenders, architects, civil engineering team, designers, legal team, contractor, jurisdictional agencies in planning, licensing, transportation, and the Baltimore Development Corporation. During the developer’s presentation, images were projected on outdoor movie theater screens, with the pool overlooking the Inner Harbor in the backdrop. The leafy green garden, dog park, and canoe-themed bar came together to foster an urban park feel. The high rise extends living spaces with resort-like amenities, including the green oasis, fitness gym, yoga and movement studio, demonstration kitchen, game room, and lounge. The slightly curved building design is finished with floor-to-ceiling glass for the architectural aesthetic and maximum indoor sunlight. Between the Harbor, Federal Hill, Camden Yards, and M&T Bank Stadium, no unit has a bad view. Different living needs are met through a variety of floor plans, each named after a spice as an homage to Baltimore’s own McCormick. The first 14 floors are open and leasing, with rent averaging around $2,800 per month. Construction of the remaining 34 floors is set to continue through the end of this calendar year. Guests had the opportunity to tour units on different floors and mingled afterward over refreshments.